There’s a mix of larger works and smaller ones: Beam’s recognizable usage of images both historical and contemporary is present, and the pieces stretch over nearly two decades. Beam, like many artists whom work in collage, appropriating and sampling imagery from diverse sources, also repeats some images that either previously held an iconic quality. A classic Northern Renaissance pieta – perhaps Eduard Quarton, perhaps not – is all angles and mourning. My art history degree was focused on this period, and its quite emotive. There’s an image of Hoiia-Wotoma, also known as Wolf Robe, from a 1909 photograph. This image has been used / misused and abused by many artists, sometimes acknowledging the man in Gill’s photo, sometimes not. Some argue this image – as, considering the history of colonialism, and with a nod to the Columbus Project, Hoiia-Wotoma’s image became a stereotypical symbol of the “long vanished Indian” – was the basis of the Buffalo Head or Indian Head Nickel. Several artworks feature an image of Jennifer Lopez: this had a relevance to Beam’s work at the time he made them nearly two decades ago (‘Lopez, while giving a strong voice to women…is still an agent of consumerism’, the panel claims), but also has a relevance in the public sphere since . Consider the rhetoric from George Bush II, about how the U.S. anthem simply couldn’t be sung in anything but English, or the ongoing debate about walls, immigration, and colonialism that is festering like a uniquely American (as in hypocritical) sore, south of the border…. 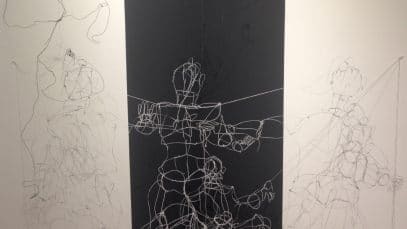 To return to the accompanying statement: Areas of Beam’s work explore relations between Western and Indigenous peoples and tensions that exist in those relationships. Thanks for the background on Beam, I always liked his work.